I worry constantly. I worry about what I say, what I type, what I do – I spend my life terrified that someone might prove me wrong, or worse, prove me wrong publicly. My inner monologue consists of so much self-doubt that my brain constantly hurts. I’m not stupid – I’ve got a good job – but inside I’m a nervous wreck. If I’m near a computer I’ll check everything I say and everything I type. Online dictionaries, encyclopedias, news sites – every possible source until I’m certain that I’m correct. When I’m away from a PC, peace of mind is just a few short clicks away via my phone’s internet browser. Even simple words and facts get double and triple checked. In the past few days I’ve googled the dictionary definitions of ‘innocuous’, ‘default’ and ‘good egg’. Have a look at an excerpt from my Facebook page last night. 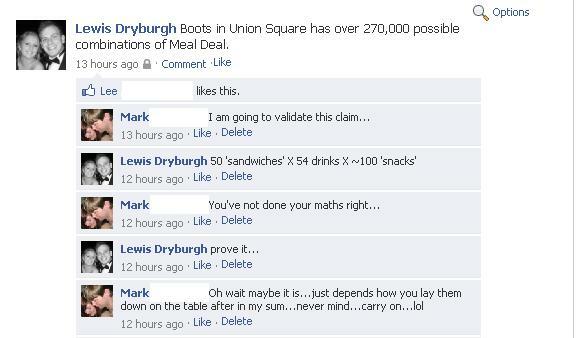 You might think that I come across as calm and authoritative in this exchange, but when Mark posted “You’ve not done your maths right” a part of me nearly died. I started sweating and blushing. I felt sick. In the minutes between my “Prove it” and Mark’s retraction I felt like I wanted to burn down the entire world… and I was right! Can you imagine what would happen to me if I was actually proven wrong? But you will never prove me wrong, because by the time that I open my mouth to speak, hover my cursor over ‘Post’ or press my thumb against the ‘Send’ button – I am Right. Everyone MUST make mistakes to progress in life, to learn and to correct their actions in the future. Without mistakes, we would be at a standstill. How else could we learn? Mistakes are not your enemy, Lewis. Try to see their positive sides (EVERYTHING has two sides), embrace them, and become a happy person inside.